Can this dhtml menu frames have images as well as text? Docs are not clear on it. A: I'm not sure I understand your question. These are image-based dhtml menu frames (four vertical round buttons on the left side). Onthe right side there is a content DIV. You can add any html elementsinside the DIV (text, images, forms and so on). 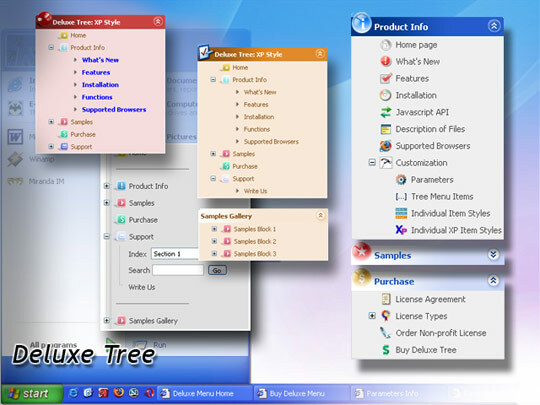 Q: I bought on September 28th the complete pack Deluxe after having tried it for an application which is not a site but which contains HTML pages and drop-down menus which were made with deluxe tree. I deleted the trial version and installed the definitive version. A: See, you should register the menu for a domain name or for IP address. with Single or Multiple licenses. If you want to use the menu with an application that doesn't have afixed domain name you should buy Developer License. With the Developer license you can use the menu on an unlimited number of Internet or Intranet sites and on the local machines.This version of the script doesn't check keys and it isn't bound to a domain name,so it can be used with an application that doesn't have a fixed domain name. Q: I'm trying out your cool dropdown menu code. I have a problem. In my case, I have some really long labels and some short ones. In some cases my text is larger than the button (see attachment). In your example all the buttons have the same width. Is it possible to have a Vista styled menu with different width for the buttons? A: See images in Vista Templates have the fixed width and height (92 x 21). If you want to change items' width/height you should change images. You can do it in any graph editor, for example in Adobe PhotoShop. You should also change items width in your Individual Item Style. You can do it in Deluxe Tuner. Q: I have implemented a deluxe-menu on my client's website and I had a couple of questions. 2. In internet explorer, when you mouse over Need An Expert?, Technology the first time you go to the page, there is a 3-4 second delay before the submenu opens. There are a lot of submenu items under Technology, but in Firefox, there doesn't seem to be this delay. Do you know why this would happen in IE? Is there a way to fix it? Could the problem be that each submenu item has a background graphic and this is causing the delay? A: 1. The scroll speed depends on number of items to be scrolled, more items -> faster scroll. You can decrease the number of items or enlarge the size of submenu. It will load all backgrounds on page load, no on mouseover. May 18, 2005 ... 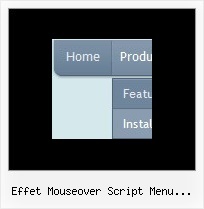 Anybody knows the action script for a Pause botton? I need a botton to pause the ... Do you know how to make a mouse over effect happen? Joomla! • View topic - Bought a template, mouse over menu won't work!! nice script! The setting "build effect = 0" does not show the menu instantly. Maybe the menu should be configurable in a settings file? Click once on iClock in your menubar, a menu will come down and you will choose .... Q: How do I change settings for my desktop effect?